Zaher Omareen: A Bedtime Story For Eid. 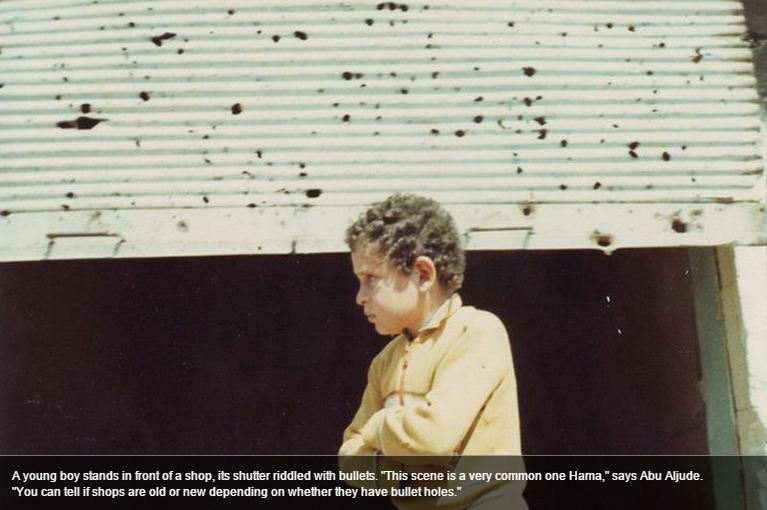 I recently wrote about the Hama massacre, marking thirty-three years since it had happened. This month, to pay respect to the victims of that horrible event that took place in February of 1982, I am sharing one more story. It is Zaher Omareen’s tale A Bedtime Story For Eid. Zaher Omareen is a Syrian writer who is currently completing Tales of the Orontes River, a collection of short stories drawn from the collective memories of the 1982 Hama massacre. A Bedtime Story For Eid is one of those stories (translation by Alice Guthrie). “—So he gave you a kiss, and wished you a happy Eid, and said ‘Send my love to your Mom?’ My God, what a good memory that guy’s got! Yeah, those guys used to live over at al-Tawafra, right near al-Kaylaneya. You know where I mean, don’t you? Al-Tawafra was your grandparents’ old neighborhood, actually. —Yeah, I know—but al-Kaylaneya? Where’s that? —Hmm, al-Kaylaneya, you kids are too young to remember it, aren’t you? Well, it’s like—where would it be now? It was more or less that whole area from where the Afamia Hotel is now, all the way across to the street on the right of the bridge, yeah—opposite the Saba’ al-Arab family orchard. You know that bit of scrubland where you all play football? That used to be part of the al-Kaylaneya neighborhood. —What, were there houses there before, then? Was it not always empty? —Of course there were—there was a waterwheel there, too, and the al-Kaylani family palace, and one of those old zawiyas, you know, a traditional tomb shrine—but all that’s long gone, it’s just bare earth there now . . .. And no one dares build on that land—it was seized by the regime and became state property. Your Granny’s dear friend Um Omara used to live right by there. That poor woman’s got such a story: during The Events they came for her kids, they took all three of them—and those boys were all so lovely, such beautiful lads . . . One was in high school, one was just about to graduate from the Faculty of Business at the Uni, and the eldest was a mechanical engineer—his name was Omar. —The one we read al-Fatiha for at the cemetery today? Was it his grave we prayed over? —Yep, that’s him, that’s Omar. That man’s really got a story . . .. After The Events happened, Um Omara nearly lost her mind, trying to find out whether her sons had survived or been executed; of course in those days absolutely no one dared to ask the authorities what had happened to their children, or where they were. A few years after The Events, news reached Um Omara that her two younger sons had passed away in al-rush—someone had been there when they were martyred, had seen it all happen, and told her about it . . . so she knew it was definitely true. But she wasn’t able to find out anything at all about her eldest son, Omar. Now, Um Omara, may she rest in peace, was a God-fearing woman! I still remember—I must’ve been about fourteen then, I would’ve been in the ninth grade or so—she used to come round to your granny’s a lot, and I remember how she always used to say to her, ‘My heart doesn’t lie, Hajja: I can feel it—something tells me Omar’s still alive.’ She had this sense about it and it didn’t let her rest. Anyway, eventually some kind people put her in touch with this man who supposedly had proper security force connections—he was meant to be getting news of people’s kids for them, apparently, letting them know where they were being held, maybe even how they were doing and all that. So she went to meet him and asked him about her son. He said to her ‘For 200,000 Syrian pounds I can tell you if he’s dead or alive.’ Um Omara was a widow in her fifties: she was hard up, she had always lived off her relatives. But—ya haram—a mother’s heart . . ..
She sold her house in Bashoura, in the Old City, to raise some cash—but she only got peanuts for it, you know, this was some time in the mid-nineties; she bought a tiny flat in the suburbs to live in, and then gave that guy all the money she had, the whole lot, so he’d get news of her son for her. And from then on he started getting more and more money out of Um Omara—she sold off all the furniture from her old house, which was that proper original pearl inlay stuff, real quality, and then she sold her gold jewelry, and then when all that was gone she started borrowing money to pay him, running up debts…. But he just kept on stalling, for ages, until in the end she found out he was nothing but a crook, some security services bullshitter with no inside access to prison records at all—and eventually he disappeared: no one ever saw him again. Time passed, seasons came and went, as they do; after several years—I don’t know how many—a little group of prisoners were let out. Now, as you know, the custom, whenever someone was released from prison, was that everyone in Hama would go and see them, to greet them and welcome them back and all that—offering their blessings, really, on their return—but also, of course, to ask them about their disappeared children: Had they seen them? Were they incarcerated with them? Where were they being held? Are they OK? Are they alive? One of the prisoners released in this particular little group told Um Omara that Omar had been held with him for a while in Tadmor prison, but that he’d been taken out of their cell two days before The Tadmor Events. He said they’d taken Omar away naked . . . This guy had managed to keep Omar’s shirt the whole rest of the time he was in prison, and he had it with him. He said to Um Omara ‘I think your son must have passed away . . . because that was right before they shot hundreds of prisoners right there in the yard, my God, I don’t even know how many . . .’ And sure enough he handed her Omar’s shirt, and she just knew straight away it was her son’s—a mother’s heart, you see, Son? There’s nothing like it. —Absolutely. She didn’t doubt the news for a minute. And so the next day she opened up her house for three days of mourning, with her son’s shirt on display for everyone to see. I’ve never forgotten the sight of that tattered, faded blue shirt hanging from the middle of the sitting room ceiling on an old wooden hanger. The women all poured into the little flat for the wake, praying for Um Omara’s sanity, saying things like ‘God protect Um Omara from what her mind must endure.’ Anyway, after the three days of mourning, Um Omara took the shirt to the Sreheen cemetery and buried it and had a proper stone tomb made, with flower beds and a headstone and everything. She wanted somewhere she could go to remember her son, poor woman, she was heartbroken, destroyed, really . . .. And from then on she went to that grave every single Thursday and read the Quran over it, put flowers on it, and watered the plants growing there . . . until, about a year or so later, the force of her grief and pain overwhelmed her and she passed away. She’d only been dead a year when another batch of prisoners were released—and guess who was let out with them this time? —What are you talking about?! —It’s true, honestly—he came out alive! And they let him out after he’d done something like twenty years inside. It turned out that when he was moved out of that cell the other prisoner’d told Um Omara about, just before The Tadmor Events, they actually took him to the Palestine Branch of the Security Services. —And then what? What happened to him after that?! —I’m getting to that, hang on! That poor man . . . when he finally got let out it was the middle of the night—cos they only ever used to release anyone from prison in the small hours, the real dead of night. The state security agents took him back to his old family home and dumped him there outside the door. Poor old thing, he sat there on the doorstep for hours, until the dawn call to prayer sounded—he didn’t dare knock at the door and frighten his family. When the azan sang out, the new owner of the house got out of bed to go to the mosque; when he opened his front door he found a stranger sitting there on the step. He thought he was a beggar, and he gave him five Syrian pounds. But apparently at that Omar just burst into tears and cried like a little child. So the man asked him his name, and he knew straight away who he was. —How? How come he knew about him? —Son, everybody knows everybody in Hama—and everybody knows everybody’s stories! You know how the old saying goes. ‘Mother gathers the family together and keeps them close.’ Well, in Hama it’s more like ‘Misery gathers the community together and keeps them close.’ But also, when Um Omara did that full mourning ceremony for the shirt, everyone talked about it, even more than usual—she became an exemplar of suffering, somehow. So anyway, the owner of the house rang Omar’s relations right away! And the aunts and uncles, whoever was left of his extended family by then, all came to get him and took him to their place and bit by bit they filled him in on what’d happened to his family. Eventually he had to take in that the old house in Tawafra was gone, his Mom was dead, his brothers were dead—and that even he, himself, was supposedly dead! Well, as usual, the good people of the city really rallied round—someone found him a place to live, someone sorted out a job for him, someone helped him with his medical stuff . . .. My auntie Um Ibrahim used to really love Um Omara, God rest her soul, and she had a young daughter called Samiha—she got pregnant with her when she was already quite old, actually—and anyway she offered Omar her hand in marriage. And you see, thank goodness, how life moves on, Samiha bore Omar a lovely little daughter who they named Rajaa, after his mother—but everyone in the neighborhood and all the relations always just call her Um Omara! And poor old Omar, bless him, once things were a bit more sorted out and settled for him, he started doing what his mother used to do: every Thursday, still, he visits his mother’s grave, and puts myrtle on it—and as he’s passing, he waters the plants on his own grave, too. —And where is he now? —What do you mean ‘Where is he now? !’ He’s that guy who gave you a kiss today, in the cemetery, and told you to send his love to your Mom. He still remembers me—he used to walk me and my sisters to school when we were in primary. —Oh, I see! But wait, why do they call his Mom Um Omara, as if she was the mother of a woman called Omara, which isn’t even a real name? Shouldn’t they call her Um Omar? —Well, according to your granny, when Omar was born, he was such a beautiful little baby that everyone thought he was a girl! So his mother got called Um Omara instead of Um Omar, and it stuck . . ..
For more on Zaher Omareen and this story, go to Words Without Borders. → Libya: A Story Forgotten. ← Zakaria Mohammad: Is This Home?